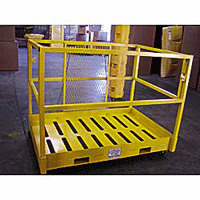 Slip-resistant 11-ga. treadplate deck is surrounded by a 4"H kickplate and 42"H square tube removable 1-1/4" thick, 16-ga. railings. 42"H mesh guard protects personnel from moving parts. Unit attaches to truck via 3x6" fork pockets with screw-down bolts and double safety chains. Regulations require using a forklift that is at least 41"W at the outside of the wheels. 3" swivel casters. Safety yellow. Unassembled. Meets OSHA and ANSI standards.